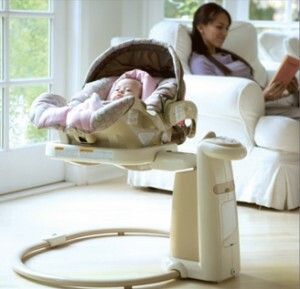 The baby swing is a critical piece of baby gear, especially for parents of newborns. The rhythmic back-and-forth rocking motion of swings is an ideal soother for fussiness or just to induce a little nap. Fair warning, though: some babies love swings, some babies just tolerate them, and some will wail any time you try to put them in. Occasionally it’s just a phase, and you can acclimate your little one to a swing over time. It’s important to find the right swing. We’ve owned three of them, two full-sized and a portable one. There are dozens upon dozens of different swings, in various sizes, with a wide range of features. Fisher-Price and Graco are the market leaders; it’s hard to find a swing in the top 20 bestseller list that’s not made by one of those two companies. 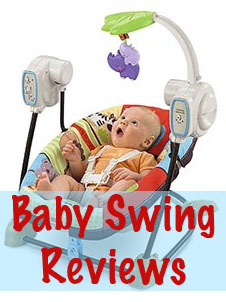 Here we review a few of the bestselling models of different types of baby swings. We’ve been through a few baby swings, and there are a few important features to consider. Swing size. Because baby swings have moving part and nobody wants a lawsuit, they have very solid bases. This translates into a big space “footprint” in your house when you have the swing set up, so plan accordingly. Swing options. The more speeds, the better. A newborn will usually be fine with the lowest setting. You can slow it down even more by adding weight (such as a swaddler or receiving blanket under the baby). Also, a swing that pivots or otherwise swings front-to-back and side-to-side is a nice feature. Power source. More than any other type of baby gear I’ve encountered, baby swings eat batteries. Usually we’re talking C or D batteries, too, which are expensive. Taking AA’s is good. Having an A/C plugin option is even better. Music and sound. 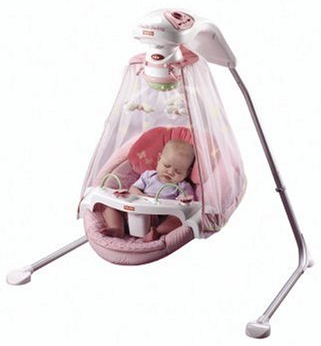 Most baby swings come with built-in baby lullabies, music, or soothing sounds. These are a nice feature but I personally don’t find it critical, since you could always keep a soother or sound machine nearby. The current #1 bestselling swing on Amazon is your all-around, fully featured swing from Fisher Price. The My Little Snugabunny Cradle ‘n Swing has all of the bells and whistles: a bird mobile and mirror ball to keep your baby entertained, 16 songs and 2 nature sounds, and three different swing positions to offer your baby a range of motions. It folds up for storage, but this is a big piece of baby gear even folded up. Prepare for that. The footprint for a swing in your home (while not folded) is probably 3 feet by 3 feet. My favorite feature of this swing is the A/C adapter power option, which lets you run it from a plug rather than batteries. Swings eat batteries like no other device I’ve ever seen, so this is a real advantage. Next up is the portable Space Saver Swing and Seat, also from Fisher Price. 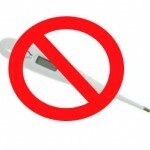 We bought one of these and found it incredibly useful due to its smaller size. It’s about half the size of a full swing when set up. It has handles for moving the swing even while your baby is in it, which is good for moving room-to-room. The Space-Saver Swing is exactly that: because it folds up almost completely flat, you can throw it in the car and bring it just about anywhere. Even though it’s small, the bucket seat really holds the baby well. You must use the harness, though; an active baby can otherwise find a way out. That little clip on the bottom lets you convert the swing to a stationary seat. The only down-side is that this runs on 4 C batteries and goes through them rather quickly. Over 6 months I probably changed the batteries 5-6 times. I still think it’s worthwhile. Next up is a unique-looking swing, the Graco Sweetpeace Newborn Soothing Center. This swing benefits from a patented “Mommotion” rocking motion that simulates the way that a mother rocks her baby. It also has a removable seat with vibration, so it can be used as a floor rocker as well. You can even swap in most Graco car seats (if you have one) to provide an easy transition between car and home. There’s a good selection of natural sounds, white noises, and upbeat songs; you can also plug in your iPod or MP3 player. The swing itself plugs into the wall, which I love, but the seat vibration takes D batteries. Given all of these soothing features, this is my recommended swing for a fussy baby. 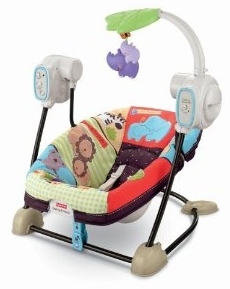 How cute is this Tree Party Cradle ‘n Swing from Fisher Price? This butterfly-themed swing is the ultimate soother: a comfy bucket seat, six different speeds, and it rocks either front to back or side to side. Probably the most important (and rare) feature is a quick-release power cord so that you can save money on batteries while at home. Additional soothing features include bullfrog or cricket sounds, eight lullabies, and a little projection butterfly light display that dances on the canopy, entertaining your baby as she rocks off to sleep. 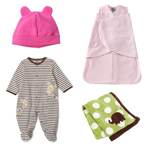 Newborn Sleep Wear covers the six things that your newborn should sleep in every night. 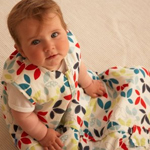 Baby Sleep Sacks & Bags reviews the benefits and bestsellers of baby sleep sacks and sleeping bags. 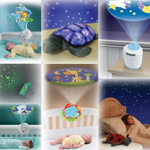 Projection Night Lights keep your baby entertained while in the crib and help soothe him back to sleep. Visit our sleep training section for strategies and tips for teaching your baby to sleep through the night.